Happiness. 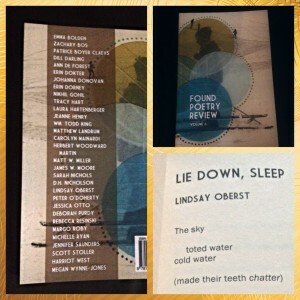 : ) My poem, “Lie Down, Sleep,” appears in volume six of The Found Poetry Review. I’m thrilled to be a part of this awesome print journal, which focuses on found poetry. I wrote this poem from Caroline Miller’s Lamb in His Bosom, which is the same source as the longer project I have completed, but this poem is not part of the collection. While writing, this poem took on a life of its own, and I was happy to see where it went. You can purchase a copy of the poetry journal on Amazon if you wish.